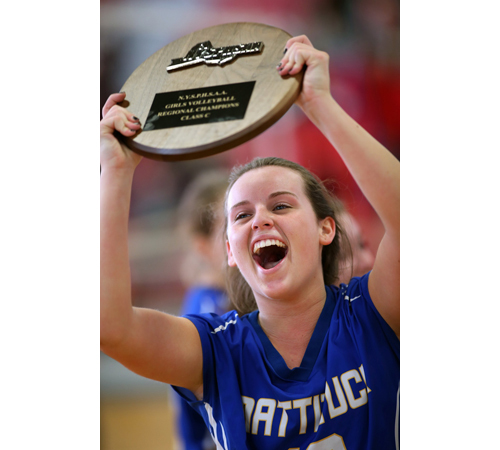 Here’s a scene Mattituck has envisioned since the start of preseason practice: the Tuckers sprawled out on the court, clutching the Long Island Class C championship plaque with smiles as big as volleyballs. Because of inconvenient scheduling, the Mattituck Tuckers had a long bus ride home from Farmingdale State College on Friday evening. After a night’s rest, they will be back on the road the following morning for an even longer bus ride back west to Mamaroneck High School. GARRET MEADE PHOTO | Wheatley's Charley Cooper and Mattituck's Tyler Connell pursued the ball during the Long Island Class B final. To call the Long Island Class B boys soccer final one-sided doesn’t say enough. From the opening whistle, the assertive Wheatley players pushed forward and were all over their Mattituck counterparts. Not only did Wheatley dominate possession, but the Warriors expended an incredible amount of energy, putting their speed and skill to good use. They chased after every ball, allowed the Tuckers precious little time on the ball, and launched one shot after another. They had done just about everything — except score a goal, that is. Credit Mattituck’s senior goalkeeper, Austin Scoggin, for that. Scoggin was in sensational form, and his outstanding play enabled Mattituck to take Wheatley to sudden-victory overtime. But that is when Mattituck’s dream ended. Jonathan Kowalczyk, a senior forward who has demonstrated a knack for scoring big goals, did so again. His 10th goal of the year in the second overtime period put an end to 95 minutes 47 seconds of spellbinding soccer, bringing Wheatley a well-deserved 1-0 triumph on Tuesday night at Diamond in the Pines in Coram. After his goal, which was set up by Zach Kreuger and Daniel Solomon, Kowalczyk immediately ripped off his jersey and darted back toward the center of the field before being mobbed by joyous teammates. It is Wheatley’s first Long Island championship since 2004, when the Wildcats were state champions. One couldn’t say that Wheatley (13-3-2) didn’t work hard for this one. The Nassau County champions outshot Mattituck by a remarkable count, 35-4 (Alex Butwin and Kowalczyk had nine shots each). Furthermore, they earned nine of the game’s 11 corner kicks. GARRET MEADE PHOTO | Wheatley's goal scorer, Jonathan Kowalczyk, took on Mattituck's Brenden Andersen. “I didn’t think one team could dominate a game so much and squeak it out, 1-nothing,” said Wheatley coach Steve Cadet. Give props to Scoggin for making things interesting. Scoggin, playing in his final game for Mattituck (11-7-1), was brilliant. Among Scoggin’s 11 saves were some nice ones, like the nifty one-handed save he made on Kowalczyk in the 26th minute. Others were of even higher quality. Wheatley looked to have a sure goal less than four minutes into the second half when Kowalczyk, all alone in front of the Mattituck goal, saw another one of his attempts stopped by Scoggin. But the best of Scoggin was still to come later in the second half: A quick pass from Butwin to Landon Baker led to a hard shot on goal that Scoggin made a nice reflex stop on before covering up the rebound; Brian Engbarth executed a bicycle kick only to be denied by Scoggin’s diving save; Butwin delivered a cutting through ball for Kowalczyk, whose shot was knocked over the crossbar by Scoggin. “He was unreal today,” marveled Kowalczyk, who said he had never faced a goalie who played that well before. In addition to his 11 saves, Scoggin, playing confidently, caught five crosses and cleared another two. Wheatley started out so well that Mattituck didn’t have a possession on the offensive half of the field until the ninth minute. The Wildcats’ best chance of the first half came in the waning moments of the half. Jason Clark pulled a ball back and centered into the goalmouth from where Butwin struck a first-time effort wide to the left of the mark. With Mattituck holding on for dear life, there was one attempt that Scoggin didn’t stop that nearly went in. In the 70th minute, Kowalczyk took a close-range shot that deflected off a Mattituck defender’s leg and bounced off the outside of the left goalpost for a corner kick. Meanwhile, Wheatley goalkeeper Eric Orologio had a fairly easy night. He was called upon to make only two saves as Wheatley posted its fifth straight shutout. The Wildcats haven’t conceded a goal since Oct. 12. Wheatley will get a chance to extend that streak on Saturday when it will play in a Southeast Region final against an unknown opponent at Diamond in the Pines. The Wildcats can thank Kowalczyk for getting the goal to send them through. Kowalczyk, one of Wheatley’s 10 starting seniors who remember last year’s Long Island final when they lost to Mattituck on this same field, also scored the only goal in the Nassau final against Cold Spring Harbor. 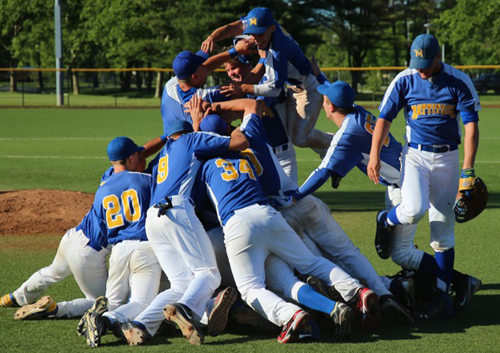 With the sudden ending to Tuesday night’s game, Mattituck players collapsed on the field as if they had been shot.